This feels like a player by virtue of it being a creature and therefore being able to come down off cavern of souls. Does not prevent a player from playing more copies after its initial effect but has upside against things like thopter tokens as well. I think the real question becomes is potential uncounterablity with cavern relevant enough to make the body worth it. Does block snapcaster all day though. 1 power and uncounterable isn't enough to make Detention Sphere playable. It really needed much more oomph, at least 2 power and some kind of evasion, and even then, a 3 mana sorcery removal isn't quite enough for vintage. I think this is really good. On par, or better than Palace Jailer which sees play. @john-cox man, Palace Jailer is waaaaaay better than this. He's a draw engine too. Its also not a human. (right now at least) he doesn't have a tribe that is vintage playable for efficient use of Caverns. And Cavern isn't thaaaaat vintage playable. Cavern is dubious, this new vedalken is below medium. @khahan "Wizard" has to be one of the better tribes, right? Most of the best Humans are Wizards anyway, I'd thought. Very true, most wizards are human. But most humans played in vintage are not wizards. There absolutely could be a viable deck out there waiting to be built. But as of right now, it doesn't exist. Wizards as a tribe seems to fail at 2 things: a reasonable control aspect and a reasonable clock. This is not a complete list and has some very sketchy choices in it. But there are interesting wizards out there. I just dont think wizards is a tribe that in and of itself supports a deck like humans or goblins could (or even elves). However, there are certainly some very playable wizards that supplement other decks. 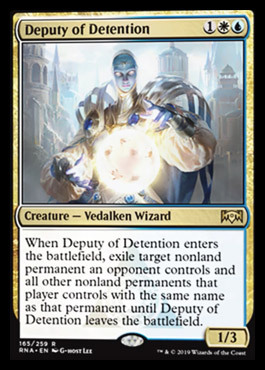 @khahan There's also Vendilion Clique, Trinket Mage, Dark Confidant and the ones not that playable like Venser, Magus of the Moat, Lab Maniac, Master of Waves, Sower of Temptation and Azami, Lady of Scrolls. I'm probably also forgetting a bunch, since there are a lot of Wizards out there. And you have Vedalken Aethermage as a tutor of sorts, so that's something. Agreed, those are all good choices, some are even played now. But there still isn't a cohesive 'wizards tribe' deck out there for vintage. I think possibly something around Adeliz's ability may possibly be viable. She can pack quite the punch and on turn 3 with even 1 other wizard in play its not unreasonable to be swinging for hefty damage. You just need a few cheap spells next turn and its a turn 4 aggro win. Not as good as shops and it folds to a walking ballista but its not without merit that a turn 4 kill is realistic. The problem with a deck like this is you need enough cheap wizards to benefit from adeliz sufficiently. This cuts down on slots for instants/sorceries. Now to stay viable you are splitting the rest of slots between spells to play on your turn to pump adeliz and counter magic to keep sphere effects off the table and stop your opponent from comboing out. Just dont think wizards has the components needed for tribal. I'd still relegate them to a support class. @khahan Am I crazy to remember that at some point far in the past there was a wizards deck in vintage. I think it was vial biased with Cursecatcher, Meddling mage, and Delver. I think this was pre-Innistrad. Was that a fever dream? @khahan I agree there isn't a tribal Wizards deck (Baral would be terrible in such a deck). But there's merit in the Wizards subtype, that's all I'm saying. @protoaddct This depends on what qualifies as "a deck" to you. I know I've seen tribal wizards at tournaments before - I've seen Patron Wizard take someone apart more than once. I don't know that it's ever been successful on a wide enough scale to be considered a regular part of the global metagame, though. Delver of Secrets is a wizard too right? Could do a deck with this, delvers and Snap Casters and Baral. @john-cox Is this card really worth building a deck for? @fsecco No, its not a build around card. I could see it being a one of in a mentor/lavinia sideboard. How often in Vintage is this gonna hit more than 1 thing outside of Tokens? 2 sphere's maybe? But this seems very hard to cast through multiple sphere's, so idk what it would even be used for. Reflector Mage and Counterspell Spirit both seem better in the same colors, and better creature type. As well as Jailer already mentioned. You snag a sphere with until they drop a ballista and shoot it. Or they just attack thru and he dies blocking any creature in the deck that has received a counter from steel overseer. This card just has no place in vintage.